Christmas trees: It isn’t easy to let go of holiday decorations, but eventually, it’s a must. While festive and fun, natural Christmas trees become fire hazards after a week inside. It’s a new year! Dispose of your tree appropriately to make way for fresh plants and decorations. Storage: While plant life in storage may be sheltered from the elements right now, it still needs to be checked for spotting. Rotting fruits, vegetables, and bulbs need to be tossed. Exposure to the air keeps produce fresh; if necessary, place stored fruits and vegetables in slotted bins and trays. 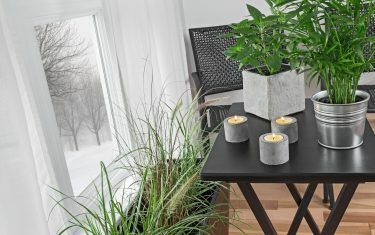 Houseplant maintenance: There’s always more you can do to keep houseplants comfortable while they’re cooped up inside all winter. Dust is bad for plants so wash leaves off when they start to look dirty. Shorter days means sunlight is even more precious; adjust plants so they soak in as much as possible. Meanwhile, especially cold temperatures chill glass so plants shouldn’t sit too closely to windows. If there’s still a problem, layers of newspaper and cardboard can stop cold from getting inside. Houseplant hydration: Inside air gets too dry to be particularly habitable for plants. Increase indoors humidity by misting plants and placing them on top of moistened pebbles. While houseplants don’t need to be watered as often during the winter, they still get thirsty. Give them room temperature water, but watch for signs that tap water doesn’t agree with them. If fluoride and chlorine are the issue, leave water containers out overnight, giving gasses the chance to dissipate. Clean containers: It can be difficult to remove filth from clay containers, but there are ways to make cleaning easier. Loosen the crust that’s formed on pots by soaking them overnight in homemade solution, consisting of one gallon of water and one cup of white vinegar. Afterwards, scrubbing pots clean with a steel wool pad should be a breeze. Rinse the containers with clear water and consider sanitizing them with another solution. Substitute the white vinegar with bleach this time; in combination with one gallon of water, bleach sanitizes effectively. Soil: Anticipate planting season by turning the soil whenever it thaws. This process destroys pests, causing insect eggs and larvae to rise to the surface, where they’ll be seen and eaten by hungry birds. Exposed pests that survive may also be eradicated when the soil freezes again. Snow and ice: While snow may be a nuisance when it’s all over your yard and in your way, it can serve as a warm blanket for perennials, regardless of its cold temperature. After using your shovel or blower, spread snow over perennials the way you would with mulch. Salt and other melters may pose a threat to ice, but they endanger plants as well. Create natural traction by scattering sand, bird seed, sawdust or vermiculite over slippery walkways. Mulch: Real mulch is the best way to protect perennials. Due to wind and snow, mulch may need to be redistributed to key places in your yard. While reapplying mulch, check perennials for plants affected by frost heave. Any plants that have escaped the soil should be replanted and covered with mulch. Limbs: In fact, the yard needs to be checked for general signs of wear and tear caused by the weather. Strong winds and heavy precipitation can break limbs. If that’s occurred, remove broken branches carefully as soon as you can, to prevent bark tearing. Pruning: Purposeful pruning can also be accomplished during the winter in certain, specific instances. Research the variety of tree, shrub, or flower you intend to prune before getting underway. Some types should be allowed to grow naturally until it gets warmer outside. You don’t want to nip any potential spring growth in the bud. Garden layout: Analyze your current garden layout, whether you’ve created diagrams or not. Would another arrangement save you time, look more attractive, or produce a greater yield? Consider how a different layout might make it easier to mow or do chores, for example. Consolidating plant groupings can save time and effort. Before planting season kicks into high gear, research and plan until a commitment needs to be made and the real work begins. Spring plants: Another thing you can do while waiting for warm weather to return is actually one of the most fun parts of gardening. Study notes, browse gardening catalogs, and create wish lists in anticipation of spring. While narrowing down prospective purchases, prioritize plants especially resistant to pests, diseases, and drought.